Ideal for use in planters, trays and pots, these robust plant labels are the perfect choice for all marking jobs around your garden. 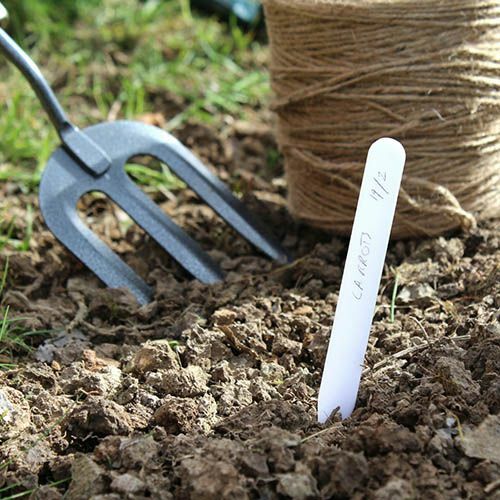 Made from high quality plastic, this set of labels is ideal for all gardeners, whether novice or professional. At 12.5cm approximately in length, they have been designed with pointed ends and a punched tip to ensure they can be planted or used as tie-on tags. The robust design of the label ensures that your marker will remain readable and in place and they are also rot proof meaning that they can be reused. Each pack contains 50 plant labels and a pencil for marking. Length (each marker) : 12.5cm (5 inches) approx. Each pack contains 50 markers and pencil.